Good morning internet! Monday morning, we meet again. As I predicted on Friday, this weekend was full of a lot of cleaning and organizing around the house. But it wasn't all work. We manged to have some fun too. Friday night, one of my best friends was in town for a conference, so we got the treat of having dinner with her and another friend. After that it was home and to bed early for a productive Saturday. Which also started off with a little bit of fun. So far I am loving my new phone! It is definitely bigger than the iPhone 5, but I can still use it with one hand. 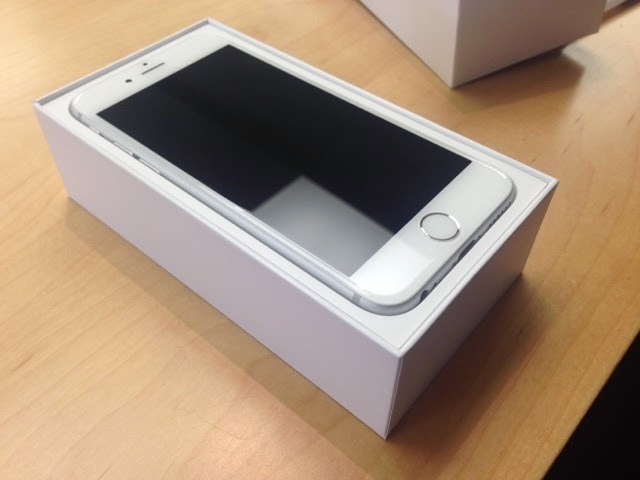 The iPhone 6 plus was not for me. No way, no how. Way too big. Even this size is an adjustment, but for how much I use my phone, in the long run I think I am going to enjoy the slightly larger screen. I ended up getting the Silver 128g. I am so excited for the extra memory I can't even tell you! I was on the fence about going Gold or Silver and just when I thought I'd decided on Gold, the Apple Store only had Silver available and made the decision for me. I'm still waiting for my cases to arrive, but I've ordered two from Amazon. This one and this one. And I'm having a blast with some of it's new features, like the slo-mo video feature. Sunday was spent watching the Packers beat the Bears (hubby was more than a little grumpy. i tried not to gloat too much) and getting more projects done around the house. Earlier in the week, we popped by Home Goods and found this beauty that HAD to come home with us. Taittinger is my favorite champagne. It's genetic. It was my grandmother's favorite, my mom's favorite (maybe mom? I'm actually not 100% sure if it is your favorite, but I know it is up there) and my favorite. So there you have it. Not the most exciting weekend in the world, but it sure will feel good to come home tonight after work to a clean house. And because this is too cute not to share, here is one last picture of our king of the mountain from doggy day camp last week. Ok maybe not one last picture. I was spotted. And then someone was ready to come home. Gotta love doggy day camp! Cute puppy quota for a Monday. Hope you have a great week! Sounds like a very productive weekend! I love having a clean house and did some cleaning and organizing myself over the weekend. Don't you just love great finds at stores like Home Goods? Thanks for stopping by Alyson! Glad you had a productive weekend too! I now have to go hunting at Home Goods for another picture because this fell off the wall this morning and shattered everywhere. So sad! But i do like a good hunt! Did you get your phone? I am love love loving mine! Thanks so much for stopping by Meghan! I'm so happy you got the iPhone 6 too!! I absolutely love mine and how great is the battery life!! All day and I still have more than half of my battery left! I loved the other woman too - cameron diaz's clothes were amazing in the movie! The battery life is amazing! Blowing my expectations out of the water! Thanks for stopping by!